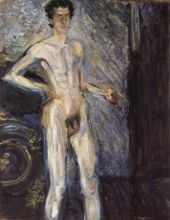 Richard Gerstl (September 14, 1883 – November 4, 1908) was an Austrian painter and draughtsman known for his expressive psychologically insightful portraits, his lack of critical acclaim during his lifetime, and his affair with the wife of Arnold Schoenberg which led to his suicide. Early in his life, Gerstl decided to become an artist, much to the dismay of his father. After performing poorly in school and being forced to leave the famed Piaristengymnasium in Vienna as a result of "disciplinary difficulties," his financially stable parents provided him with private tutors. 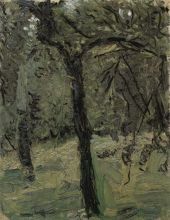 In 1898, at the age of fifteen, Gerstl was accepted the Academy of Fine Arts Vienna where he studied under the notoriously opinionated and difficult Christian Griepenkerl. Gerstl began to reject the style of the Vienna Secession and what he felt was pretentious art. This eventually prompted his vocal professor to proclaim, "The way you paint, I piss in the snow!" 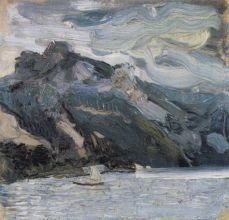 Frustrated with the lack of acceptance of his non-secessionist painting style, Gerstl continued to paint without any formal guidance for two years. 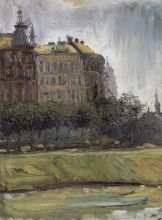 For the summers of 1900 and 1901, Gerstl studied under the guidance of Simon Hollósy in Nagybánya. Inspired by the more liberal leanings of Heinrich Lefler, Gerstl once again attempted formal education. Unfortunately, his refusal to participate in a procession in honor of Emperor Franz Joseph I of Austria further ostracized him and led to his departure. Gerstl felt that taking part in such an event was "unworthy of an artist." His final exit from Lefler's studio took place in 1908. 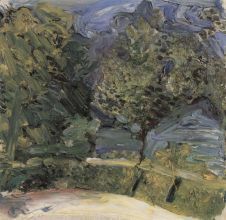 In 1904 and 1905, Gerstl shared a studio with his former academy classmate and friend, Viktor Hammer. Although Hammer had assisted in Gerstl's admittance to Lefler's tutelage and their relationship was friendly, it is difficult to determine how close the two gentlemen were as Gerstl did not associate himself with other artists. 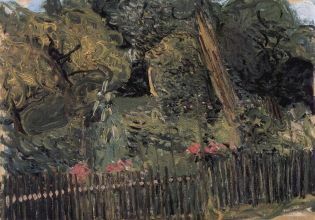 Regardless of their personal feelings, by 1906, Gerstl had acquired his own personal studio.